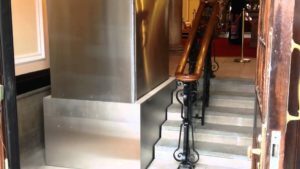 Lifts have been around for more than a century and a big reason for their success is not only their ability to transport pretty much anything from one level to another with relative ease and simplicity between multiple levels of varying height and distance from one another. The first lifts in history were very simple machines, operated by pulleys and man-power and made from very simple components including wood and rope or flax. However through history, development after development has leaded us to the modern lift, built predominantly out of metal and powered by electricity. Retractable stairs system perfectly integrates the ramp concept and stair design. The time and hassle reducing stair lifts are provided by sesame access and going from stair to lift or vice versa takes only seconds. It all happens at just the push of button. Best of all, the lifts are customizable and can fit almost any space. They can be used indoor or outdoor from apartment buildings to universities. Sesame Access is providing a simple yet effective system that addresses the mobility challenges surrounding getting in and out of a building with stairs at the entrance. Charlie Lyons, who is also a hydraulic engineer, had the original idea for the lifts after observing the issues a friend in a wheelchair was having around the city. Designed for indoor or outdoor use, their products are divided into 3 broad categories: platforms with only lifts, lifts with stairs and minimum pit & bespoke designs.